Project, GIS education, and GIS-related internal and external meetings, events, and announcements are listed in this calendar. If you would like for us to list your event, please contact us. The meeting minutes for previous meetings are available from the document archive. The calendar was last updated on May 29th, 2009. There are no scheduled upcoming events. If you know of an event or would like to suggest an event please contact us at shepardj@rohan.sdsu.edu. 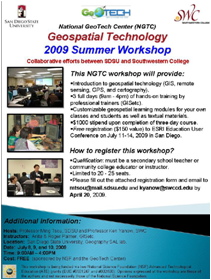 This 3 day workshop introduces particpants to geospatial technology (GIS, remote sensing, GPS, and cartography). Instructors: Anita and Roger Palmer, GISetc.